A contemporary Donegal handwoven tweed blazer. The fabric is a green salt and pepper, designed and woven in Donegal, Ireland. 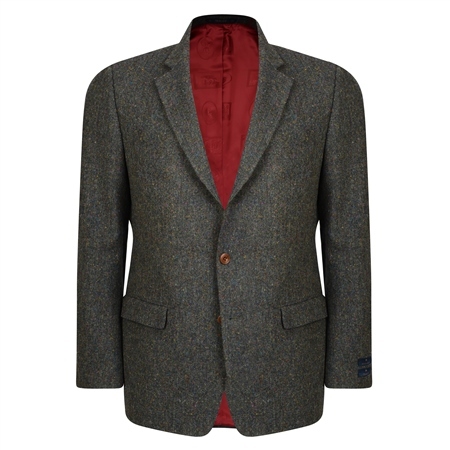 The blazer styling is timeless with straight pockets, side vents and contrast under collar. While touring in Ireland we stopped in Peac**kes for a cup of coffee and discovered the Craft Shop (Connemara Gifts). I saw this jacket and had to have it. Unfortunately, they only had it in 48R. The proprietor, Brid, graciously ordered it in 48L from Magee and had it shipped to me in the states. It fit perfectly and the fabric is superb. All the women just can't help themselves and run their hands over the material. On a sunny day or under decent lighting, the flecks of color just light up. The diversity of colors permits a wide range of dress options (shirts, ties, etc.). I highly recommend this jacket. I was originally looking for a herringbone coat, but since this was one of the very few size 36R coats in stock, I took a chance with it. It's a perfect fit, very high quality, and I received it two working days after I ordered it via free FedEx shipping! I'm very impressed with Magee, and am now looking forward to finding that herringbone coat in a size 36R! I was somewhat concerned that there may be a different interpretation of sizes between Ireland and the US, but it was spot on. I've been wearing it daily ever since. Thanks, Magee! This is the jacket I have been waiting for. The Donegal fleck, fabric, fit, styling and manufacture are all perfect. The colour is a grey-green rather than pure green. It has garnered many positive comments in its first two wears. I have already ordered the blue-grey version. I'm delighted. Thank you for the quick delivery and the craft involved in making this wonderful jacket. Hello, I am interested in these jacket. What size would you recommend. My chest is 107.5cm and my shoulder's width is 48,3cm from the should bone to the collar to the bone (not in straight line). straight line is about 47cm. Thanks and regards. Pascal.